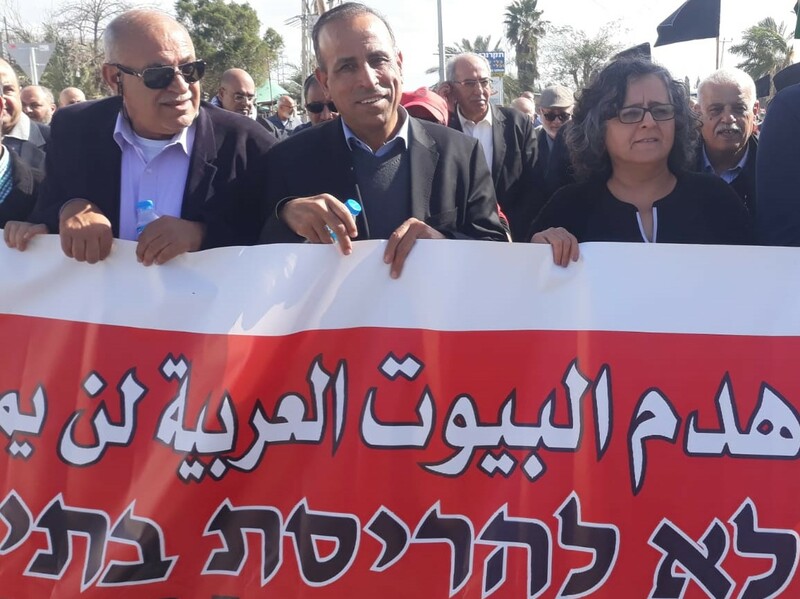 All four Hadash MKs and leading members of the Communist Party of Israel joined several hundred Arab and Jewish citizens of Israel on Friday, Febuary 8, to protest the impending demolition of 17 homes in the Arab city of Qalansawe in the “Southern Triangle” in the center of the country. A dozen homes have already been demolished in Qalansawe in recent years making it a flashpoint for demonstrations against the far-right government’s home demolition policy. In January, Israel’s Planning and Construction Committee issued their decision to demolish 17 homes in Qalansawe that were designated has having been “built illegally,” but residents of the city – including the mayor – say that if the demolitions are carried out, they could have drastic consequences. The far-right government uses demolition of homes in Arab towns and cities, among other reasons, as a means of appeasing right-wing Israelis outraged by the demolition of illegal outposts in the occupied West Bank such as Amona. However, more fundamentally, the policy of demolitions of Arab homes within the green line (Israel’s pre-1967 borders) are an inherent part of the state’s ongoing, long-term and less publicized attempts to ethnically cleanse Arab citizens by undermining there ability to lead a normal life. It is estimated that, within the Arab community inside Israel, there are currently some 50,000 Arab homes that are potential targets for demolition, ostensibly because they were built without official permits and are in violation of zoning codes. A key to understanding such legalize is that, since its founding, Israel has appropriated vast amounts of land from Arab cities, towns and villages on the one hand, while on the other hand the governmental institutions have purposely dragged their heels in rezoning agricultural land to land on which homes can be built legally, something which it does slowly but regularly in Jewish areas of the country. The authorities have created a Catch-22 situation for Arab communities throughout Israel by using technicalities to continually delay the procedure whereby land can be made residential in nature. Landowners, unable to get permits have, in tens of thousands of cases, gone ahead and built homes for themselves and their children, even though they know that the state can exploit its “law” and demolish any and all such homes and other structures. The only question for the state, in its present character, is how big of an explosion it wants to ignite among its Arab citizens.